I have always been one of those people who tries to think positively whenever possible. Even when I'm having a day where nothing is going right, I try to find that little ray of sunshine in the midst of all the rain. So it was a given that I would most likely enjoy The Pollyanna Plan by Talli Roland, which is about thinking positively. Then again, anything with Talli Roland's name attached to it just has to be good, right?!? Emma Beckett breaks up with her fiancé and loses her job in the same week. Could things possibly get any worse? The realist in her only sees things going further downhill. With hopes to help her look on the bright side of life, Emma's best friend Alice challenges her to be more like Pollyanna, a character from a children's book who is well known for her optimistic attitude. Emma takes her up on this challenge, not knowing where it will lead, even when some good things come her way as a result. Will Emma's new outlook on life help change things for the better, or will she go back to her old ways at the first sign of trouble? I needn't worry about going into this novel with a positive attitude, as Talli had me charmed from the very beginning. She has a knack for storytelling by creating convincing characters and an interesting plot line. This has been evident in the other books I've read of hers and she hasn't let me down yet (and looking optimistically ahead, I don't think she ever will)! 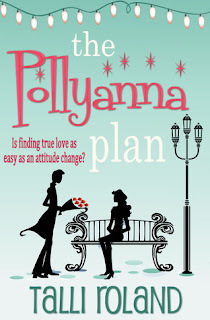 The Pollyanna Plan was a sweet story with a clever concept. I only wish there were some real life Pollyanna "movement," where people all over the world would be challenged to take on a more positive attitude. It felt like a female version of Yes Man (a movie adapted from a Danny Wallace novel, starring Jim Carrey, that also takes on a positive approach to life). There are two main characters in The Pollyanna Plan. Aside from Emma's story, we also get to hear about Will, Emma's potential love interest. He has his own sad story, which somewhat clashes with things that have gone on in Emma's life. Yet, he and Emma have this amazing chemistry. I found myself truly hoping they'd work out the stuff that was keeping them from being together. And while there's a steamy moment in the story, Talli leaves us wondering what actually happened behind closed doors. I wouldn't have minded some details. Maybe that's just me, but when the opportunity for a good "romantic scene" comes in to play, I won't complain if a few pages are devoted to that scene. Aside from the romantic plot, there is also a story line involving Emma's family, which I found captivating. I even became emotional over it at one point, as her mother and sister seemed so real. I also liked her relationship with Alice, which seemed very genuine and had the realistic feel of what sometimes goes on when friends don't see eye to eye. Alice reminded me more of myself...the positive and supportive type. Also, Talli's use of description made me feel like I was in London in the winter. I had an easy time visualizing people and places throughout the story and she didn't even go overboard with details. The amount she used was just right and she painted pictures in my mind as easily as Emma drew pictures on her sketch pad. I really enjoyed The Pollyanna Plan and look forward to catching up on some novels of Talli's that I missed, as well as reading what else she has in store. If you haven't read any of Talli's novels yet, what are you waiting for?!? She writes a perfect chick lit novel with each story she creates. Great review :o) I've loved all Talli's books so far! Thanks for the great review. I will have to try one of Talli's books. I have this on my kindle to read. I was lucky enough to see Talli read an excerpt of this novel at the Festival of Romance in Nov. Stopping by from Carole's Books You Loved February Edition I am in that list as #13. Winner of "We Hope You Like This Song"
Sophie King is cool bean(o)s! Winners of "eloves me, eloves me not"